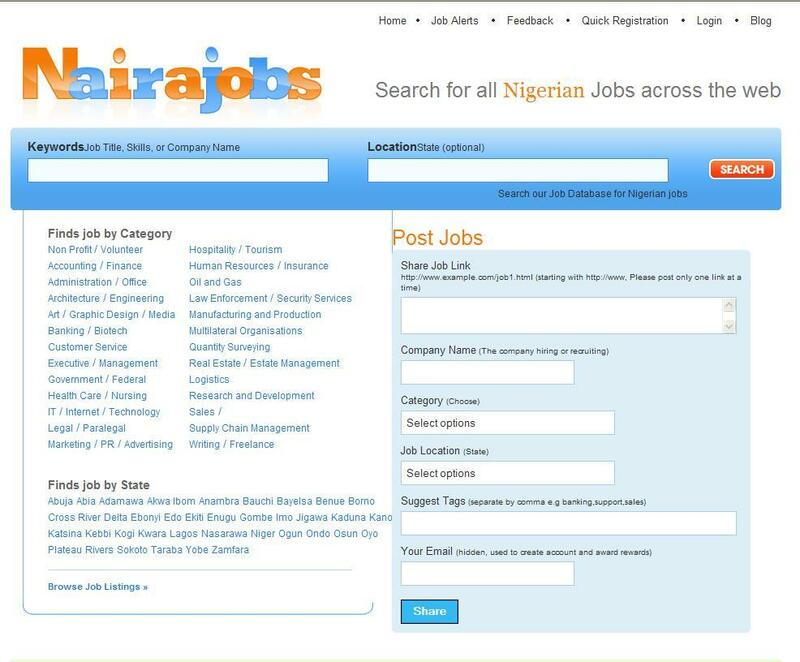 Nairajobs is a Nigerian job and career search engine that aggregates jobs for Nigerians be it overseas or in Nigeria. This jobs are gathered from various sources across the internet. This is an initiative to create a one stop station for all jobs that is related to Nigeria for Nigerians and friends of Nigeria. Nairajobs was developed by Kayode Muyibi. The concept used by Nairajobs is called Vertical Job Listing and it is not new. Vertical Job Listings was born when it became extremely inconvenient for job-seekers to visit every single recruitment portal, company website, forums, and read every classifieds etc in their locality when seeking for a job. This concept is an attempt to help save time and ease the job search process. Nairajobs not only solves that but wants to co-exist with other job portals that is currently listing jobs it intends to aggregate. What we do at Nairajobs is we link to websites that list to jobs, because we believe that the traffic belongs to them. We do not steal content from portals that list them, but rather provide an aggregated summary with a link to the original source for the details. Nairajobs aggregates job postings from job boards, corporation websites, online classifieds and newspapers every day through your contribution and through our own manual entry. Kayode Muyibi it is irresponsible, wicked and unprofessional for you and your team at nairahost.com to “ignore” my requests for this long (since December 23rd!). 3) while i appreciate the fact that it is not easy running a web hosting firm the downtimes on my site (traedays.com) have been a litle too frequent of late. all this while nairahost.com and kayodemuyibi.com have remained up 24/7. i’m willing to pay if it’ll correct this flaw. Everybody deserves a right to ask questions and be answered. if you are having challenges kindly let me know. Relationships are built on trust, reliability and mutual respect. suffice it to say these experiences has left me bitterly dissappointed by your actions. thanks for dropping by. Its like I’m not the only one having problems with Web Hosting companies, especially when customers are left in the cold, over services to be provided. I hope Kayode drops by to read your comment and do whats needed.